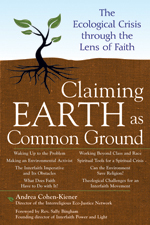 Claiming Earth as Common Ground, by Rabbi Andrea Cohen-Kiener, gathers insights from ecology coalitions, emerging theologies, and spiritual and environmental activists to rally and inspire us to work across denominational lines in order to fulfill our sacred imperative to care for God’s creation. Cohen-Kiener and contributors clearly outline the shared values of our faith traditions that drive our commitment to care for the earth. Acknowledging the challenges in working together to implement positive change, they present steps—both big and small, for individuals and groups—for reversing our direction from consumption to sustainability. 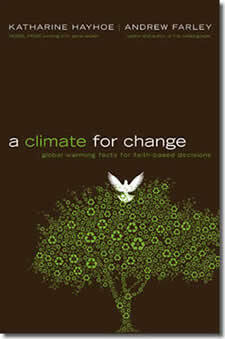 A Climate for Change: Global Warming Facts for Faith-Based Decisions, by Katharine Hayhoe and Andrew Farley, untangles the complex science and tackles many long-held misconceptions about global warming. Authored by a climate scientist and a pastor, A Climate for Change boldly explores the role of the Christian faith can play in guiding our opinions on this important global issue. 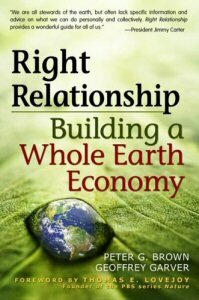 Right Relationship: Building a Whole Earth Economy, by Peter G. Brown and Geoffrey Carver, uses the core Quaker principle of “right relationship”—interacting in a way that is respectful to all and that aids the common good—as the foundation for a new economic model. Right Relationship poses five basic questions: What is an economy for? How does it work? How big is too big? What’s fair? And how can it best be governed? Play Lightly on the Earth: Nature Activites for Children 3 to 9 Years Old, by Jacqueline Horsfall, provides ideas for outdoor activities with an emphasis on learning and exploring while minimizing one’s impact. Each activity contains an objective, preperations, options and discussion questions well-suited for young children.